We are a trusted technology partner across a wide range of vehicle designers providing Unmanned Surface Vehicles (USV) control systems and design support to the creation of customs boats. Engaging in early design discussions provides an opportunity to provide input to an efficient hull and propulsion design. Our simulation (ShipSim) process helps accelerate the development by reducing the design iterations. The simulation process allows us optimise the hull design, and the propulsion type and configuration. In the situation where the vehicle design is already defined, the simulation process can be used to assess performance and pre-tune the autopilot, prior to ‘wet’ trials, reducing the time to launch. Payload integration including power management, data logging and communication can be undertaken reliably and rapidly, utilising established technology that has a proven track record. 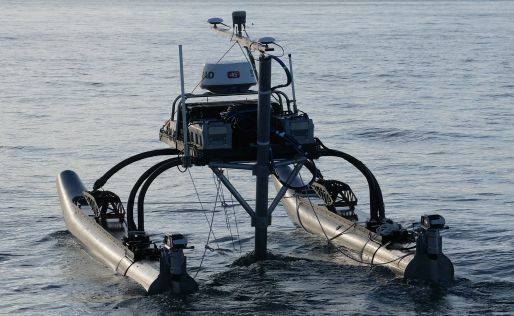 MAR’s WAM-V 16 Unmanned vessel is an innovative craft which required custom electronics. Through collaboration we rapidly deployed our standard range of electronics modules to provide a reliable control system, including Dynautics collision avoidance system and a deployment system for a Multibeam echosounder (MBES). Torqeedo – Cruise 2000 – Electric outboard motors.